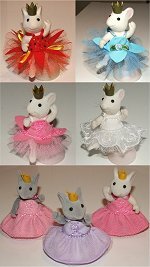 Welcome to my website for Sylvanian Family Fans where you will find lots of new fashion designs for your little Sylvanian Families, Calico Critters, Angelina Ballerina and friends which I have made over the years. Grandma's Originals evolved from my granddaughters' desire to have new clothes for their Sylvanian Family collections - especially when they lost their originals. So, with my sewing skills which were handed down by my mother, a tailoress, I got to work. I enjoy the challenge of making patterns for these charming little dolls and I am now positively hooked! I commenced selling on ebay some years ago having been encouraged to do so by family and friends, and I have been regularly requested to put up a website with my archive of photos made in the past so here it is at last! Please note I am just one person designing and making these outfits not a manufacturing company. I have included an archive of some of the outfits made over the years which I happened to photograph, together with the more recent ones and custom made outfits for your enjoyment. Do browse my current and archive photos and should you require a similar outfit for your character then contact me with the image details. I will be listing a few items on ebay as moulineuf2. Visit my boutique for new and current outfits I can make for you. Please note I only sell the clothes as the dolls are from my collection and used as models. Click below to like me on Facebook - I do not sell on Facebook but happy to make something for you.